Q? I’m in charge of our reunion this summer, and I’d like to do something a little fancier than what we’ve done in the past. We usually have a “potluck” meal where everyone brings something, but we sometimes run out of things, and the same people end up doing most of the cooking and clean up. Any suggestions for a “fun” meal that folks will remember but that won’t break out budget? A! There are lots of fun things that you could try, and many are very reasonably priced. And you’re absolutely right … having the hotel where you’re staying cater the meal, or hiring an outside catering company to do this, will allow everyone in the group to relax and enjoy themselves, rather than having to worry about cooking, cleaning up, running to the store for extra hot dog buns, etc. Many reunion groups do a themed meal, based on the group’s history or shared interests. How elaborate you get with the menu, decorations, and costumes or contests are limited only by your budget and your imagination. A Beach Party. Even if you’re not getting together at the beach, this is always fun. I’ve seen groups hold “beach party” events in a hotel ballroom in the dead of winter. Ask everyone to wear a Hawaiian shirt, flip-flops, and sunglasses. Play Jimmy Buffet and Beach Boys songs on the CD player. Serve roast pork, boiled shrimp and “hula burgers” (hamburgers with pineapple slices), and add tropical drinks with paper parasols (easily made without alcohol for children and non-drinkers). Plastic “leis” for everyone to wear are available at most party and dollar stores. A limo contest is something that everyone – young and old – can participate in! A Baseball or Football Game. Ask folks to bring baseball caps or football jerseys to wear; most folks have these in their closets at home. Most party or dollar stores have paper plates, cups, napkins, etc., with the logos of your favorite team(s). Serve ballpark food — hot dogs, hamburgers, nachos, popcorn, Crackerjacks, etc. If you’re at a picnic area outside, you can actually play softball. If not, play “baseball” indoors – players advance around the bases by answering trivia questions: a correct answer is a hit, an incorrect answer is an out. A Patriotic Theme. If your reunion is being held on (or close to) Memorial Day or the fourth of July, go with a Red, White and Blue Theme. Again, decorations are easily available at any party or dollar store, and you can ask the caterer to make a cake with red, white and blue icing (or strawberries and blueberries). Have everyone talk briefly about what they like best about America. A Taste of the United States Theme. Serve regional favorites from around the country, i.e., Boston baked beans from New England, Philadelphia cheesesteak sandwiches, Key lime pie, North Caroline barbecue, Texas chili, etc., etc. This works especially well if your family members are coming from a wide variety of locations around the country to attend the reunion. Have everyone bring some packaged food product, type of candy, or brand of soda that is only available in their area. Play “Name the State” trivia game and award prizes to those who know their geography best! Again, a themed meal need not be expensive, even if you’re having someone else cater it for you. Remember that a breakfast or lunch event will almost always be less expensive than dinner, and that certain types of food (i.e., beef and seafood) tend to be more expensive than others (chicken, pasta). Going alcohol-free will also save money, as will holding your event when the hotel is less busy. For example, a luncheon held on Sunday will typically cost less than one on Saturday, as most hotels are less busy on Sundays … always be sure to ask the caterer if you can get a better deal by holding your event on a specific day (or during a specific time of the day)! With a little advance planning and a little creativity, you can put together a special meal that people will talk about long after your reunion is over! Reunion organizers for the USS Floyd B. 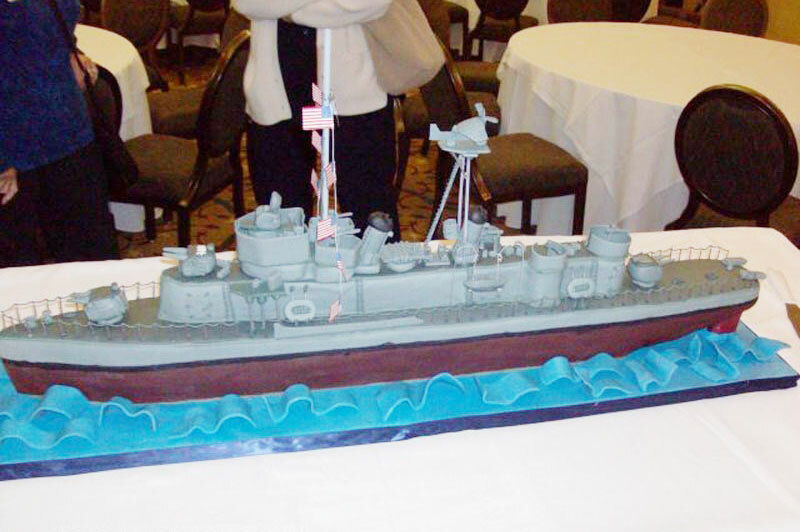 Parks reunion added a festive touch to their catered dinner by having a local bakery bake a cake in the shape of the ship. Far more fun — and more memorable — than a standard sheet cake for dessert!